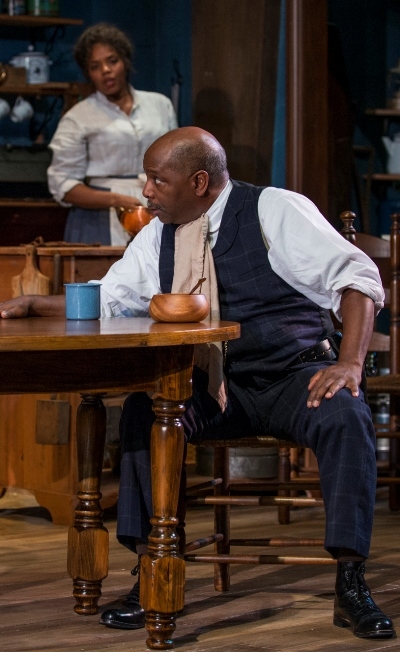 August Wilson’s decade-by-decade portrait gallery of the African-American experience across the 20th century begins just two generations after slavery, indeed with characters who were born into shackles. 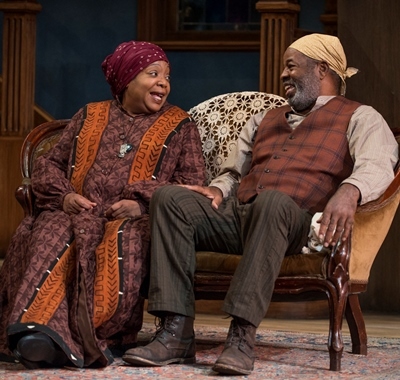 To grasp the cultural resonance and progression of the last nine plays in the sequence, it’s essential to know the first one, “Gem of the Ocean,” which now unfolds in a perceptive and finely textured production directed by Ron OJ Parson at Court Theatre. 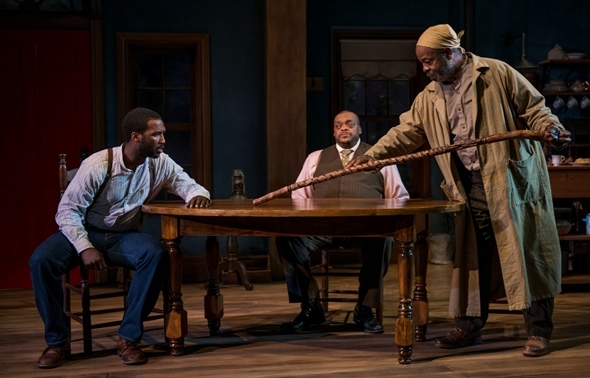 This is the seventh play in Wilson’s so-called Pittsburgh Cycle that Parson, resident artist with the company, has brought to the Court stage. His insight tells in a concept that underscores both the conflicts among people still trying to find meaning in the word “freedom” and the ties that bind the new generation to the old. A meaningful discussion of what “Gem of the Ocean” is about would require an essay considerably longer than this review. But essentially, it is about legacy, identity and transition. The ancestral African spirit, tossed and tormented, is distilled in the person of Aunt Ester (the wise, patient and indulgent Jacqueline Williams), who grew up a slave and is said to be 285 years old. Ester shares her home with her middle-aged caregiver Eli (a brick of compassion in the form of A.C. Smith) and the live-in cook Black Mary, no longer young but still beautiful – and made quietly, seductively appealing by Tyla Abercrumbie. This cobbled-together family also has a sort of auxiliary member in Solly Two Kings, who goes way back with Eli to their days as fellow slaves. Solly, who once worked for the Underground Railroad, now ekes out a meager existence collecting and selling dog excrement – or “pure,” as he has ennobled his product. Alfred H. Wilson lends Solly a fascinating mix of rebel, pragmatist and savant of the streets. 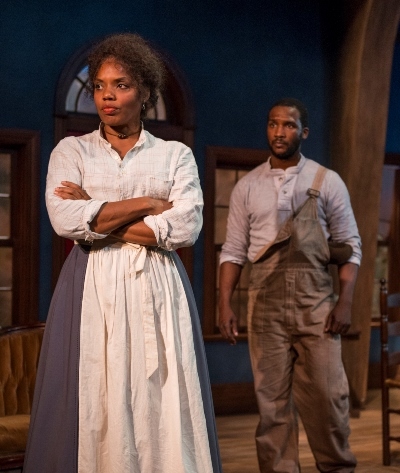 On the doorstep of this orderly and predictable household appears a twentyish youth just arrived from Alabama – broke and desperate – called Citizen Barlow (Jerod Haynes in a performance of edgy intensity and a natural sexuality that’s not lost on Black Mary). He has done a terrible thing and in hope of absolution has come to Aunt Ester, who someone has told him is a cleanser of souls. Meanwhile, the community is rocked by a drowning in the river near a mill beset by labor unrest. A man accused of stealing nails jumped into the water and, protesting his innocence, refused to come to shore until his strength gave way and he vanished. The man’s proud self-sacrifice is central to themes of the play. In part, as Solly Two Kings observes, the accused man preferred to die with his innocence rather than live under suspicion of guilt. But, as Solly also points out, there’s another part to it: The local protector of the public weal, Black Mary’s brother Caesar Wilks, has been known to shoot to kill and not bother with questions at all. Caesar is not like anyone else in Aunt Ester’s sphere, and David Alan Anderson gives a scary performance as this righteously hard-bitten man who has raised himself up by his bootstraps and puts great personal store in his badge and gun. Thus “Gem of the Ocean” might be framed as a photograph of a time, place and circumstance, and the personal options available. The choice of violence, and the satisfaction that comes with destruction in the face of injustice, is exercised by more than one character. But the spiritual quest for connection, forgiveness and peace offers an alternate route, and hence the title of the play. The Gem of the Ocean is a ship, though one of the mind and of belief. On it, so to speak, troubled young Citizen Barlow is guided by Aunt Ester to a place of redemption called the City of Bones, a small kingdom beneath the ocean – beneath the slave-trading lanes of the infamous Middle Passage – made from the bones of Africans who died en route to the New World. The plausible magic of Citizen’s journey is testimony to director Parson’s imagination, and to his sense of the enduring link between these free black people and a horrific history that they share. 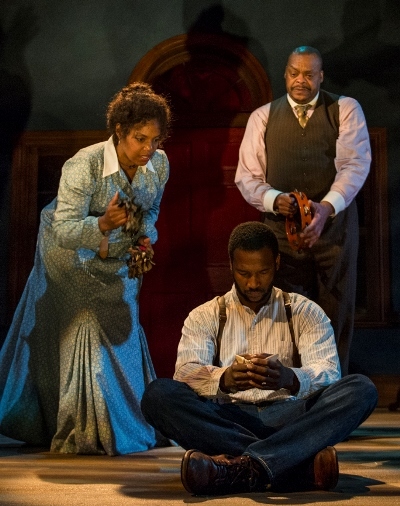 Part séance, part light show (a big credit to designer Heather Gilbert), Citizen’s redemptive voyage also attests to the tight, spontaneous ensemble work of Aunt Ester’s extended family of actors. In the ageless matriarch’s warm, comfortable home, designer Jack Magaw has create a gathering place where peace reigns, a place of sanctuary, a port in any storm for the Gem of the Ocean.